The monarchs of France ruled, first as kings and later as emperors, from the Middle Ages to 1848. There is some disagreement as to when France came into existence. The earliest date would be the establishment of the Merovingian Frankish kingdom by Clovis I in 486 with the defeat of Syagrius, the last Roman official in Gaul. That kingdom's rulers were deposed in the 8th century. The Treaty of Verdun established the Kingdom of Western Francia in 843. Another date favored by many medieval historians is 987, the beginning of the Capetian Dynasty. However, the relevance of such traditional outlooks on the origins of modern nations is historically dubious (see below for recent studies). In light of these recent trends, this list begins with Charles the Bald and the Kingdom of Western Francia, originating in 843, the state which would directly evolve into modern France. For earlier Frankish monarchs, see List of Frankish Kings. In addition to the monarchs listed below, the Kings of England and Great Britain from 1422 to 1801 also claimed the title of King of France. 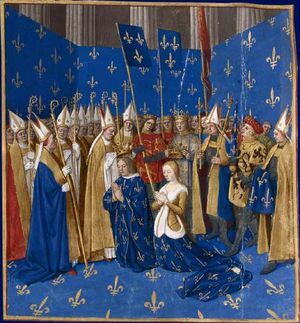 For a short time, this had some basis in fact - under the terms of the 1420 Treaty of Troyes, Charles VI had recognized his son-in-law Henry V of England as regent and heir. After the death of the two, Henry VI, succeeded his grandfather as King of France. Most of Northern France was under English control until 1435, but by 1453, the English had been expelled from all of France save Calais (and the Channel Islands), and Calais itself fell in 1558. Nevertheless, English monarchs continued to claim the title until the creation of the United Kingdom in 1801. Various English kings between 1337 and 1422 had also claimed the title of King of France, but only intermittently. The title "King of the Franks" ( Latin: Rex Francorum) remained in use until the reign of Philip IV. During the brief period when the French Constitution of 1791 was in effect (1791-1792) and after the July Revolution in 1830, the style "King of the French" was used instead of "King of France (and Navarre)". It was a constitutional innovation known as popular monarchy which linked the monarch's title to the people, not to the territory of France. The name of France comes from the Germanic tribe known as the Franks. The Merovingian kings began as mere chieftains, the oldest known being Pharamond. Clovis I was the first of these to rise to true kingship. After his death, his kingdom was split between his sons into Soissons ( Neustria), Paris, Orleans ( Burgundy), and Metz ( Austrasia). Various other kingdoms would continue to break apart and be formed as the various Merovingian kings warred with each other. The Capetian Dynasty, the male-line descendants of Hugh Capet ruled France continuously from 987 to 1792 and again from 1814 to 1848. The branches of the dynasty which ruled after 1328, however, are generally given the specific branch names of Valois and Bourbon. Many people were monarchists at the time and consequently refused to recognise the overthrow of the monarchy, and considered Louis XVI's reign to have continued until his death in 1793, then his son Louis XVII to have reigned until his death in 1795, with Louis XVIII's reign then commencing, hence the numbering. The Second French Republic lasted from 1848 to 1852, when its president, Louis Napoleon, was declared Emperor. Legitimist claimants to the throne of France — descendants of the Bourbons, rejecting all heads of state since 1830. Some "fusionists" recognised the Orléanist claimant after 1873. Orléanist claimants to the throne of France — descendants of Louis-Phillippe, rejecting all heads of state since 1848. Bonapartist claimants to the throne of France — descendants of Napoleon I and his brothers, rejecting all heads of state 1815-48, and since 1870.